Daniel, our guide was exceptional! He made our trip to Fatima incredibly special! I highly recommend this tour. The convenience of a hotel pick up and drop off is such a timesaver. Danella was EXCELLENT. Wanted to keep her for ALL of our Lisbon experiances. She is great. Go with her in her Audi A6!! Outstanding day with a great guide. Daniela from Magnificat Tours brought Fatima alive. She brought just the right touch to the tour, providing interesting explanation to the Fatima story while allowing us time to reflect on what we were seeing. We recommend Fatima and Magnificat without reservation. Our guide, Daniella, was very good. The restaurant we went to for lunch was exceptional. Amazing tour of a small family company... not only the design of the tour was great but also the guide tour was amazing. 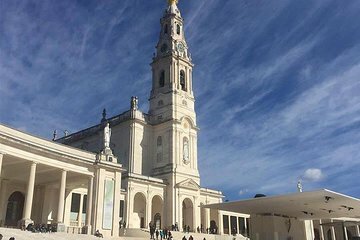 I totally recommend this tour if you want to visit Fatima. Daniela not only showed us Fatima but since we haven't gone to the Lisbon cathedral and Saint Antony church, she took us there on our way back from Fatima. Daniela, THANK YOU SO MUCH. We loved our time in Fatima and Portugal!! !